Sometimes things don't work out exactly like we expect or want them to, when the unexpected happens it can be very traumatic for all involved, yet once we accept what is, many times we discover it to be one of the greatest gifts and life lessons one can receive. Such is the case for Kasey Matthews, who seemed to have it all--everything was going as planned when suddenly she found herself in premature labor, and her daughter was born 4 months premature. Life for Kasey changed in an instant. 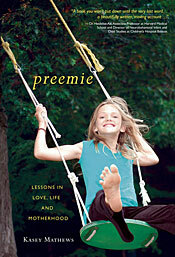 She chronicles her, and her tiny daughter's, journey of life and discovery in her book, Preemie: Lessons in Love, Life and Motherhood (Hatherleigh Press, 2012). In early thirties, Kasey Mathews has it all: a loving husband, a beautiful two-year-old son, and a second baby on the way. But what seemed a perfect life was shattered when she went into labor four months early, delivering her one-pound, eleven ounce daughter, Andie. In this riviting, honest, and often humorous memoir, Preemie chronicles the journey of one tiny baby's tenacious struggle to hold on to life and the mother who ultimately grew with her. From hospital waiting rooms to the offices of alternate practitioners, from ski slopes to Symphony Hall, Kasey tries to make meaning of her daughter's birth and eventually come to learn that gifts come in all sizes and forms, and sometimes...right on time. I think Preemie is a wonderful read for really anyone, but it would be extra support for families who are living life with a premature child, letting them know they are not alone with the fears, even though the stories won't be the same their will be enough similarities and understanding to hopefully be comforting. The book is well written, easy to read, funny and very personal, which makes the book even more special. I really enjoyed reading it and would definitely recommend it to others. Thank you to Newman for my sample used in this review, opinions are honest, review by Michelle.